I’m glad to see that you take simple notes and you doodle pretty well. HAHA! Man those are awesome! My favorite is Worship Daily with the time spend at the table with the Bible 🙂 AND you have lil words like God is talking to YOU too! Great stuff! That’s how I take notes and do my sermon outlines. 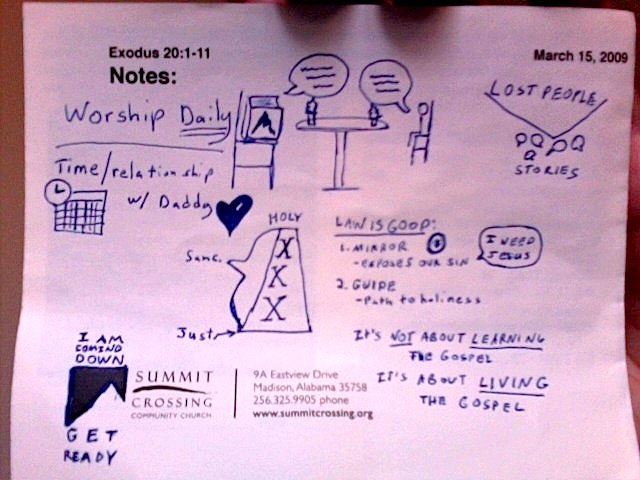 Actually, I mind-map my sermons using key words and pics to remember stories and transition points. I love it and it helps me remember. I’m trying to teach people, but sometimes they are too linear. Love your work Billy – great blog.